Most of the free apps you'll find on the Play Store have ads. These ads are personalized — in other words, they're for products and services Google believes you might be interested in. The way Google knows about your interests is by collecting data from your smartphone, including your location and app usage. While personalized ads have their advantages, the collection of data is unsettling. Google is able to collect this data using what is known as an advertising ID. This is a unique identifier attached to a packet of data that contains bits of your browsing habits and history, though it is anonymous in theory. Google then sells ad space to companies by promising they'll match the ads users see with their personal interests using the information contained in their advertising IDs. For privacy-conscious users, Google has provided a way to stop this form of tracking with a pair of settings built into Android. 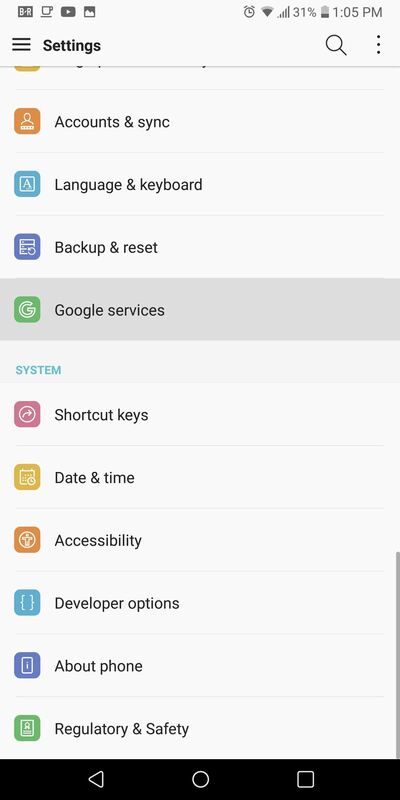 To start, head to your phone's main Settings menu, then scroll down and select the "Google" option. Depending on your OEM skin, this entry may not be on the main page, but you can use the search feature at the top of the Settings menu to find it. From there, choose "Ads," then enable the switch next to "Opt out of Ads Personalization." Now, your advertising ID won't be used by apps on your phone to build advertising profiles based on your usage. 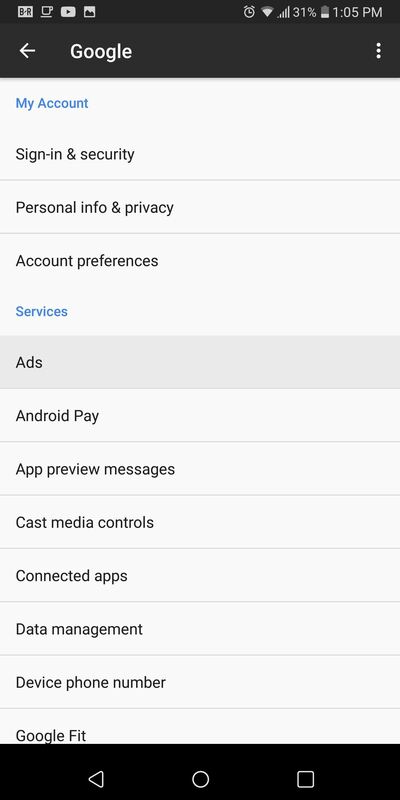 Enabling this setting will also prevent apps from displaying targeted ads. You are still tracked by Google, but random ads are shown instead. 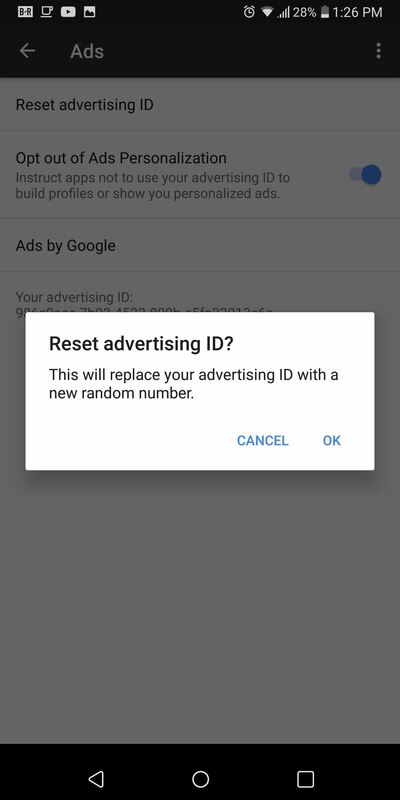 For additional protection, you can reset your advertising ID. By resetting your ID, you will remove the data that was already collected from your app and internet usage, but this isn't a permanent solution. The database of tracked information will simply return to zero, then new data will be collected using a new advertising ID. Above the "Opt out of Ads Personalization" setting in the same Google menu depicted in Step 1, you'll find an option labeled "Reset advertising ID." When you tap this, your advertising ID (which is shown below the list of options) will change to a new ID. Depending on the frequency in which you reset your ID, you can minimize the amount of data collected about you. For example, if you reset your advertising ID daily, collected information is limited to 24 hours. Since Google will still track your ID even if you opt out of personalized ads, we strongly recommend resetting your ID on a weekly basis at a minimum. 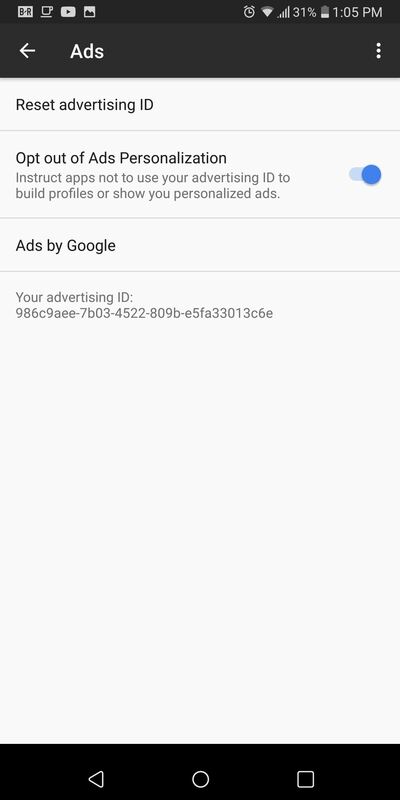 Google has taken into account those of us who wish for privacy by including the ability to stop personalized ads with Android. Do you prefer personalized ads, or is your privacy more important? Let us know in the comments below.